S and I recently had a rare night out, and headed on over to Ohio City (West Side Market neighborhood) and the near West side for a little shopping and dining, and enjoyed a nice dinner at Light Bistro. Light is in a cozy little building, and bills itself as Cleveland’s finest tapas restaurant. Now, to be honest, I don’t know how many tapas restaurants Cleveland can claim, but I took them at their word. For those unfamiliar, tapas are an idea originally borrowed from Spain, and are essentially appetizers. It’s common to have a meal consisting solely of a wide variety of different tapas, rather than a single main course. Not a bad idea, as you get to sample a whole bunch of different goodies. We had checked out the menu before we went, and it was indeed extensive. There were some more standard tapas (mushrooms, dates, olives), as well as some more unique options (rock shrimp and pork belly). If tapas aren’t your thing, they also have a regular main course menu, as well as pizzas, paninis, and burgers. Of course, we couldn’t narrow it down, so we had tapas and main courses. 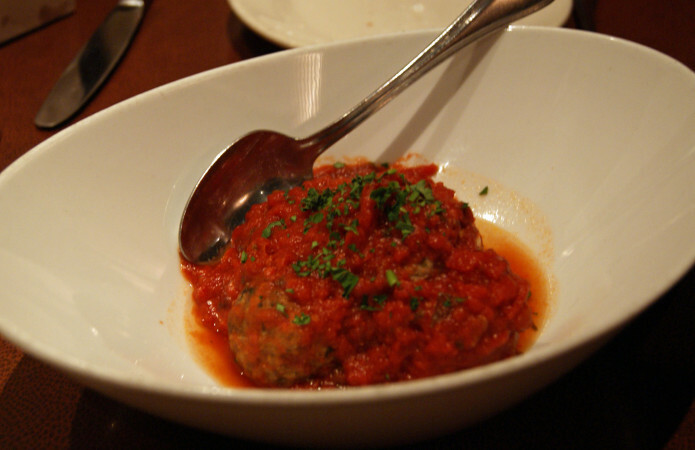 We started with lamb meatballs, which came with a mint tomato sauce. I’m not usually one for much mint in my food (if I want mint, I’ll go brush my teeth), but the traditional pairing of the lamb and mint is an exception I’ll make, and the mint was not at all overpowering. Just a little freshness for the palate to clean up after the unique flavor of the lamb (which also was not overly strong; good for S, as she’s not much of a lamb person, but she loved these). 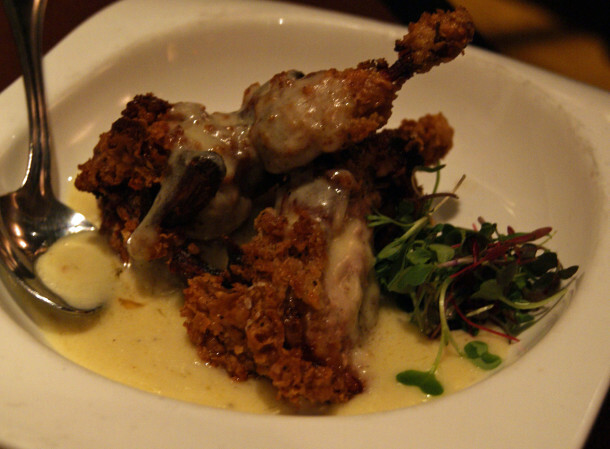 We also tried a Southern-fried quail, with potato cake and white gravy. I don’t know that I’ve ever had quail, and it tasted much like, well, chicken, but maybe slightly gamier. The highlight of this one was the fried breading – it was light and crunchy, and almost melted in my mouth. Quite good. In addition to those two, we had an order of homemade chips. We probably could have done without them, as they were pretty standard potato chips, and were a little overdone for my taste. When I’m getting homemade, I like thicker chips that are still just a little soft. Since we didn’t stop at the tapas, S had a main course of caramelized scallops, served atop black pepper risotto with tomato jam. The scallops were cooked to perfection, seared and tender. The risotto was creamy and did have a strong black pepper flavor. The tomato jam was intriguing – slightly sweet with a hint of anise and cinnamon(?). 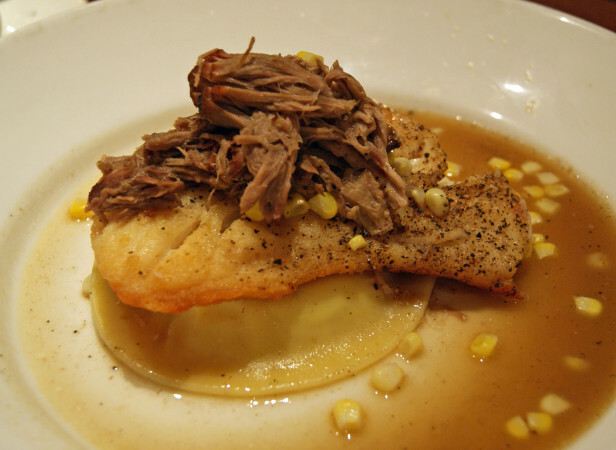 I tried the pan-seared grouper, with pulled pork, ricotta ravioli, corn, and ham broth. The grouper was flaky and moist, the pork atop it offered a little saltiness to the dish, and the ricotta ravioli (a single large one; does that make it a raviolus?) was delectable. Final verdict: Light Bistro gets a 5 1/2 out of seven stars. Food is unique, and there are many options, so you’re bound to find something you like. Our server took a few minutes to warm up to us, but ended up very nice. Prices run the gamut, depending on what you’re after. Tapas range from $3 to $19, main courses are all $22-29, and pizzas and sandwiches are mostly in the $11-15 range. A very good meal, and a nice ambience on a cold night.